Five out of ten prefectures of Moscow administrative districts banned the YABLOKO party from organising pickets near metro stations on the occasion of the 16th anniversary of the disaster Chernobyl nuclear power station. However, according to the YABLOKO press service, on April 25 and April 26 the party will distribute leaflets to about 100 metro stations, and on April 26 a meeting will be held at Kaluzhskaya square, Moscow. The leader of YABLOKO Grigory Yavlinsky and well-known environmentalists and human rights activists will speak at the meeting. The leader of the Russian Democratic Party YABLOKO Grigory Yavlinsky thinks that pressures on President Putin's foreign policy imposed by certain political and bureaucratic forces aimed at ensuring changes to the present course have increased recently. MOSCOW - Russia's lower house of parliament launched debate Wednesday on a law strengthening the constitutional provision of alternative service with guarantees that would remove NOVOSIBIRSK, Russia (Reuters) - Alexander Lebed, a tough-talking general who played a key role in foiling the 1991 coup against Mikhail Gorbachev and ran for president against Boris Yeltsin five years later, died Sunday in a helicopter crash. By Natalia Yefimova, The Moscow Times, April 29, 2002. Moscow. About 300 people took part in the meeting against the import of spent fuel into Russia. The meeting was held in the centre of Moscow on Kaluga square on the evening of April 26, on the 16th anniversary of the accident at the Chernobyl NPP. The meeting was organized by the Russian Democratic Party Yabloko with the support of environmental and human rights organizations as part of an All-Russian action that was held in over 50 regions. MOSCOW - Russia's dangerous radioactive legacy of the Soviet-era nuclear sector has become a matter of domestic and international concern. While the Russian authorities, notably the Nuclear Power Ministry - or Minatom - argue that the country's nuclear facilities sector is safe, some international environmental organizations, non-governmental organizations (NGOs), and parliament deputies are far from convinced. By Robin Munro Staff Writer, The Moscow Times, April 26, 2002. Police, Kremlin security officers and plainclothes officers forcefully broke up a peaceful demonstration against nuclear waste imports on Red Square on Thursday, cuffing young protesters in the face before hauling them by their collars to waiting police cars and roughly slamming them in. By Andrei Zolotov Jr. Staff Writer, The Moscow Times, April 23, 2002. Leading State Duma deputies warned on Monday that the strong showing of far-right leader Jean-Marie Le Pen in France's weekend presidential election should serve as a wake-up call. The leader of the YABLOKO party Grigory Yavlinsky thinks that representatives of the authorities are completely responsible for possible outbursts of skinheads on the anniversary of Hitler's birthday. "Every person beaten on these days, every victim will suffer, as the authorities shut their eyes, demonstrate criminal negligence and from time to time even stir up xenophobia," said Yavlinsky in an interview with Interfax. In general, Yavlinsky thinks that the problem of Nazism in Russia is connected to the endless war in Chechnya, as well as the intermittent nationalist declarations by some politicians, as was the case, for example, in Krasnodar Territory. Moscow. April 26 is the 16th anniversary of the accident at the Chernobyl Nuclear Power Plant. The Russian Democratic Party Yabloko plans to conduct a nationwide action with the support of public organisations. A large scandal is rising in the Duma again. Deputy Head of the YABLOKO faction Sergei Ivanenko stated that when preparing the draft law "On Citizenship" for the third reading the document was falsified. Moscow, April 19 (MK-Novosti). The leader of the Duma YABLOKO faction Grigory Yavlinsky insists on removing the draft law "On Citizenship in the RF" from the third reading in the Duma today, as the text differs from the version adopted by the lower chamber in the second reading. On the draft law "On Citizenship in the Russian Federation"
The YABLOKO faction insists on removing the draft law "On Citizenship in the RF" from the third reading in the Duma on April 19, 2002 in view of considerable deviations from the text adopted by the State Duma in the second reading. Novaya Gazeta appears to have reached a compromise with the Krasnodar judge who won an unprecedented $1 million libel suit that threatened to bankrupt the Immediately after hearing President Vladimir Putin's speech, Federation Council Speaker Sergei Mironov wrote a letter to Prime Minister Mikhail Kasyanov. The State Duma narrowly approved on first reading Wednesday thegovernment's billon alternative military service that allows young people ofdraft age to carry out civilservice if they put in twice as much time as in the army and canprove they are pacifistsat heart. The State Duma narrowly approved on first reading Wednesday thegovernment's billon alternative military service that allows young people ofdraft age to carry out As the European Union brings countries of Eastern and Central Europe into its fold over the next few years, its political clout in the region is expected to strengthen and its influence on Russian economic life is set to grow. YABLOKO called the government's draft law on alternative service "discriminatory"
Chairman of the Civil Control Committee of the YABLOKO party Valeri Borschyov said that YABLOKO oppose the government's government's draft law on alternative service prepared by the Ministry of Defence. In his view, the draft virtually blocks the formation of the institution of alternative army service. MOSCOW - Russia's lower house of parliament launched debate Wednesday on a law strengthening the constitutional provision of alternative service with guarantees that would remove conscientious objectors from legal limbo. Roll-call voting for the adoption of the federal law "On the Alternative Service". First reading. The Russian Federation and the United States. Approaches in Cooperation in Nuclear Conversion Programmes. YABLOKO's proposals. New approaches have been developed during constructive dialogue with Russian public organisations and reflect the modern role of civil society in international cooperation aimed at reducing nuclear defence programmes. Chairman of the Duma Committee on Education and Science: "We Shall Broaden Paid Education"
From the dossier of "Moskovsky Komsomolets": "Occupied the post of Deputy Chairman of the said committee. Born in Leningrad. Graduated from the Mathematics and Mechanics and Legal faculties of St. Petersburg State University, member of St. Petersburg Academic Union. 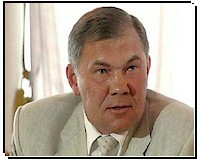 Former deputy of St. Petersburg City Council, then deputy of the State Duma of the second and third convocations. Member of the PACE Commission on Legal Issues and Human Rights. Married, two children." Who Stands Behind Russia's Foreign Policy? MOSCOW - Unlike with President Vladimir Putin's domestic policies, which are usually ascribed to one or another group of advisers within the corridors of power, the genesis of foreign policy is a murky affair. Today Grigory Yavlinsky celebrates his birthday: he has turned 50. We called on the threshold and asked him three questions, not about politics. Novaya Gazeta appears to have reached a compromise with the Krasnodar judge who won an unprecedented $1 million libel suit that threatened to bankrupt the newspaper. Novaya Gazeta representatives and Judge Alexander Chernov, who had sued the newspaper for defamation, met Friday and agreed that Chernov would write to a higher court asking that the amount of fine be cut "to a reasonable level," while the newspaper would acknowledge errors in its reporting. Moscow. April 5, 2002. Russia's economic growth will amount to 2% this year, stated the leader of the YABLOKO party Grigory Yavlinsky at a press conference today. Moscow, April 5, 2002. "I don't see any threat for Russia in the dislocation of the US troops in Georgia or Central e Asia," noted the leader of the YABLOKO party Grigory Yavlinsky at a press conference in Moscow today. According to Yavlinsky, terrorism and the drugs trade are not only Russian, but global problems, and "if the Americans can help us tackle these problems, they will ease the life of the Russian military." A governor can have only two terms of office, said YABLOKO's leader to the electorate in the Sverdlovsk region. Ekaterinburg, April 1, 2002. The third term of office should be abolished for everybody in Russia: for both the president and all governors and there should be no exceptions. The leader of the YABLOKO party Grigory Yavlinsky made this statement during a press conference on April 1, 2002. The main achievement of President Putin can be summed up as his foreign policy which is aimed at a rapprochement with the West. The President chose to follow this policy despite resistance from the political elite and his entourage. The direction of current foreign policy could have strategic prospects and become a prologue to Russia's transformation into a European state in the broadest sense of the word - from observation of human rights to the level of the population's welfare. The decision of Radio Liberty to start broadcasting in Chechen is "not very tactful towards Russia, considering the present relationships between Russia and the USA, as well as the acute situation in the Northern Caucasus." This opinion was expressed by the leader of the YABLOKO faction in the State Duma of the RF Grigory Yavlinsky in an interview with the Ekho Moskvi radio station. MOSCOW - The Russian government lashed out Thursday at U.S.-funded Radio Liberty, saying its first broadcasts to the North Caucasus region were biased in favor of Chechen rebels. Grigory Yavlinsky's speech, Bertelsmann Foundation 25th Anniversary Symposium Transforming Our World - Building. MOSCOW - Russia's lower house of parliament voted Wednesday to reshuffle the leaders of its legislative committees in a bid to give more power to centrist factions - at the expense of the Communist Party. By Oksana Yablokova Staff Writer, The Moscow Times, April 4, 2002. The State Duma voted Wednesday to reshuffle the chairmen of nearly a third of its committees, stripping the Communists of eight top posts and concentrating even greater power in the hands of centrist and liberal factions supportive of Kremlin policies. MOSCOW (AP) - Ahead of a Russian-U.S. summit next month, Russians increasingly are asking what rewards they have reaped from joining the U.S.-led anti-terrorist coalition and where President Vladimir Putin pro-Western policy is leading the nation. MOSCOW - A senior Russian lawmaker called Monday for deployment of an international peacekeeping force in the Middle East, saying that Israel and the Palestinians were unable to end the cycle of violence without outside help.